What has interested me the most about the latest film from the great writer/director duo Joel and Ethan Coen is their unique focus on such a genuine character and his bizarre series of misadventures. Llewyn Davis (Oscar Isaac) is a 1960’s New York City Greenwich Village folk musician who lives and breathes his art (it is all he has, after all), yet a man that isn’t personable enough and lacks the ability to connect to people to be a success. He also seems to have lost the courage to compromise, and given the opportunity to build something economically substantial with his talents, he inexplicably remains content to rough it alone through the unforgiving winter. 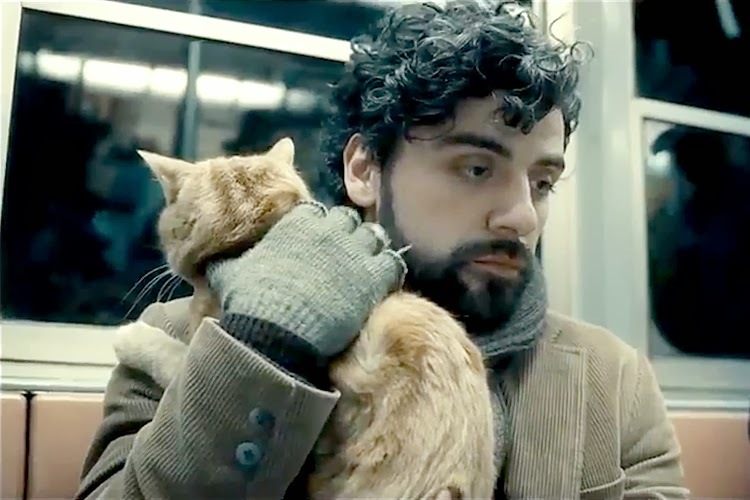 We see pieces of Llewyn’s soul disappearing as he clings his coat to his chest, drains icy water out of his shoes, laments his recent news and what his friends will say when they learn he has lost their pet. Llewyn is a middling solo act. His songs are soulful and sung with passion, but they are never going to be hits. His immediate attention is directed toward day-to-day survival, settling for the same lowly gigs, taking advantage of the couches and supplies of a small rotation of sympathetic local acquaintances. Llewyn achieved a quiet musical success with a partner, but this ended in tragedy. A solo record has been failing to sell and has been ignored by a Chicago producer his inept manager claims to have sent one to. Llewyn is experiencing a dumping of bad luck. The guy needs a break, yet isn’t doing himself any favors in earning one.